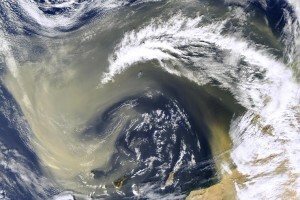 WILLEMSTAD – Dust particles from sand storms in the Sahara desert have blanketed sections of the Caribbean, including the ABC-islands, affecting air quality in the region. Each year, Saharan dust storms pass through the region, usually in the spring and summer months. This is according to the Meteorological Department of Curaçao (Meteo). Meteo indicates that the dust cloud is significant even when it comes to the quality of dust in the air. The dust, which comes from the Sahara Desert, causes the skies around the region to be hazy, which reduces visibility and results in poor air quality.